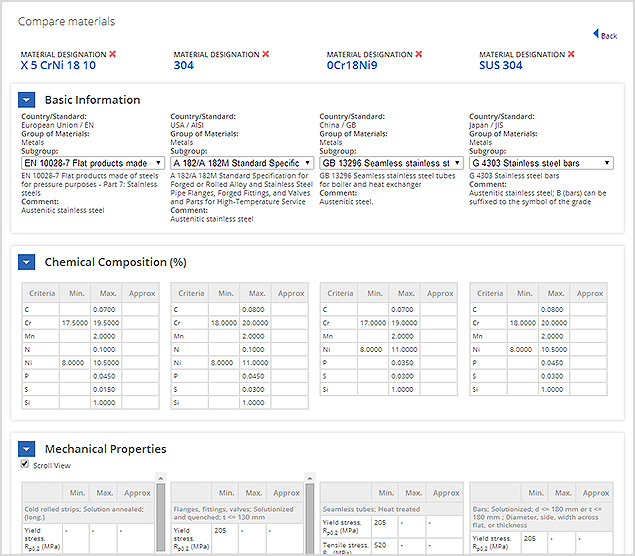 The Total Materia new Comparison View allows you to compare the chemical composition, mechanical properties and physical properties of up to 4 materials simultaneously. You can view key property information with ease by simply adding your material choices to the Comparison View and at the touch of a button you can compare the most important property characteristics in seconds! 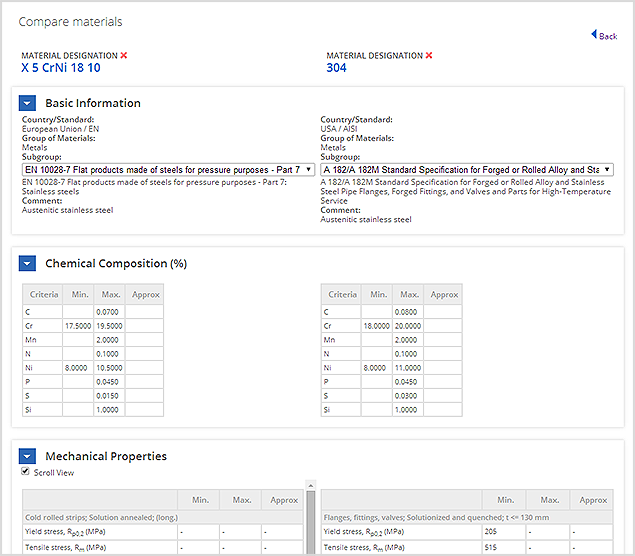 To begin using Comparison View you must select your first material for comparison. 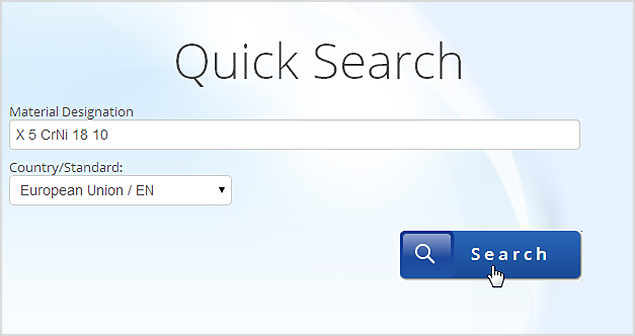 Simply choose a search option from either Quick Search or Advanced Search and enter the material designation if known or the specific search criteria to find relevant materials of interest to you. Once you have found the material for comparison in the results list click on it to see its subgroup and property information. Once you are happy with your selection you can click on the ‘Add to Comparison’ link in the material designation bar. In this example we would like to compare materials to X 5 CrNi 18 10 (EN). After you have successfully added the material to the Comparison View, you will receive a confirmation message. Adding further materials to Comparison View couldn’t be easier! Simply return to either Quick Search or Advanced Search to look for your next material of interest. This may be an equivalent material from another country or simply a material with a similar application but it is possible to compare literally any material you choose from over 450,000 held in the Total Materia database. We would like to compare material 304 (AISI). 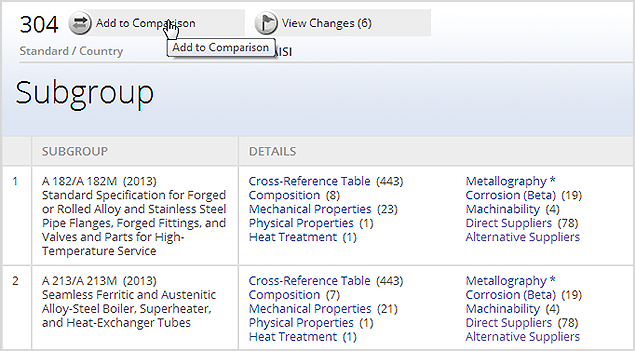 Once you have selected your next material, follow the same process as previously described in Step 2 to add it to the Comparison View. To view your selections in the Comparison View simply click on the ‘Comparison View’ button. This will then direct you to the Comparison View where your previous material selections will be presented for comparison. Once in the Comparison View it is then possible to compare materials side by side! The View will display all basic information for the chosen materials and then display all related chemical composition, mechanical property and physical property information below in handy drop down panels. There is also the option to select a different subgroup for the same designation if you wish. Materials can be added to or removed from the Comparison View at any time, allowing you to swap and change materials as you please. Step 6: Compare up to 4 materials side-by-side! It is possible to compare up to 4 materials in Comparison View by following this easy step by step guide. Designed to allow easy and efficient comparison of matertials the Comparison View allows you to save time, effort and a potential headache in doing the hardwork for you!